Yesterday the latest vampire movie opened up. I went to see it today. Been really hyper about this one ever since I saw the trailer last summer. I was like "finally, we are returning to what a vampire film is suppose to be. Brutal"
I wish our local cinema had said that on the damned website. Needless to say, if I had known before hand I would not have bothered. The last thing you want to do is cause dren in a busy line up of movie goers so I picked up my pre-ordered ticket and trudged into the screening room. So there's me, five minutes into a vomit worthy 3D movie trying not to let the migraine headache that was starting actually turn into a vomitting sitch. I was actually thinking of walking out after five minutes but ended up just removing the 3D glasses and watching it that way. In a very blurry 2D. So this is one I will be getting on DVD the second it comes out in the fall or whatever so I can sit and watch it properly in proper vision being 2D. Also did not realize it was based on a comic/graphic novel. The movie was very much geared to the males, because even the previews were all for shoot em action movies. I suppose trying to make a bit of a balance with the vamps after all the Twilight dren in the last few years, which was all geared for teenaged girls. REVIEW: The vampires and humans have been at war for centuries. Now, in a remote out-skirt a nest of vampires have upped the game. 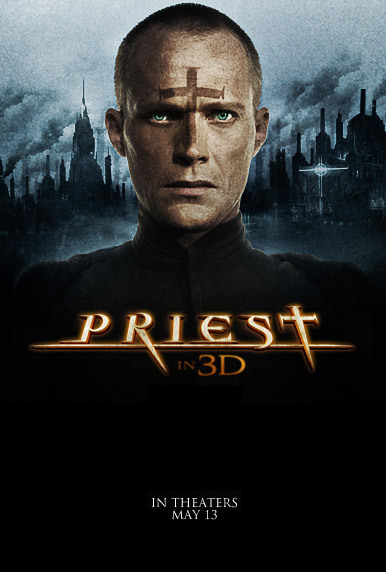 They kidnap a family member of one of the more well known Priests who have been ordered to protect humans. This leads to a renegade band lead by the Priest, the kidnapped girl's lover, and the Priestess-Warrior traveling to the area to stop them. What they learn is that Lucy is being held by a former priest who's been turned into the only living half-breed. This gives him the advantage of being able to be out in the daylight. Meanwhile, back in the city, which is run by the church, a cover-up is happening withing the rankings of the church. Everything comes to a finale on a train in the middle of the desert. Vampire fans know that when you see Christopher Plummer in a film, you know it's one you can sink your teeth into.